The CDSS Inspiration Award is awarded to two (2) people with Down syndrome (of any age) each year. 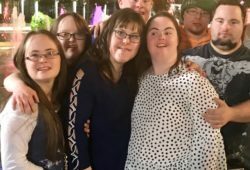 These are the unsung heroes of the Down syndrome community. This award is best suited for people who feel as though they’re not typically represented in the community, but have a story worth celebrating. The two recipients are people who demonstrate the range that “See the Ability” encompasses. 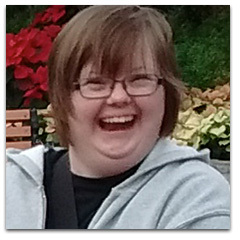 The Canadian Down Syndrome Society (CDSS) would like you to meet Sherwood Park’s Teresa Pinkoski. As a graduate of McEwan University, daycare worker and community volunteer, Teresa has inspired all those in contact with her to accomplish beyond what is expected. It is because of this that Teresa is being honoured by CDSS with a 2017 Inspiration Award. The award aims to celebrate the community’s “unsung heroes.” Teresa is one of two winners of the Inspiration Awards, announced on World Down Syndrome Day (March 21, 2017). She will receive a $500 bursary with her award. In her nomination letter, Michelle Szott, a lifelong community friend, explained that after Teresa graduated from high school with her diploma, she decided to continue her education at McEwan University. Through hard work and perseverance, she graduated with an Early Learning and Child Care modified diploma in 2016. 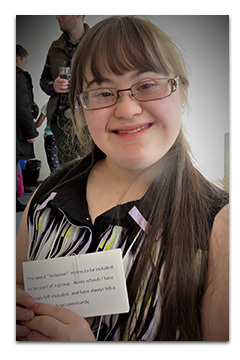 “Teresa is truly a role model for younger children who have Down syndrome,” Michelle wrote. Teresa has also contributed over 425 volunteer hours at Fort Edmonton and countless others with the Strathcona County Library. 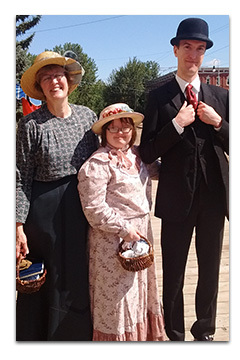 “Teresa’s confidence will ensure her success for whatever path she chooses in her life,” said Judy Glenn, Volunteer Supervisor at Fort Edmonton. Beth Kuban from the Strathcona County Library also nominated Teresa. “Don’t tell me ‘You cannot do that!’ I will prove you wrong.” These are the words of 15-year-old Laura Stremble from Dundas, a young leader in Ontario’s Down syndrome community. Laura played a major role in the passing of Bill 182 – Ontario Down Syndrome Day, speaking at Queen’s Park on behalf of other people with Down syndrome in the province. 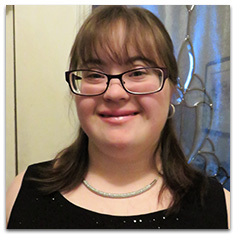 It is because of her advocacy and bravery that Laura is being honoured by the Canadian Down Syndrome Society (CDSS) with a 2017 Inspiration Award. Laura teaches all Canadians that it is never too early to stand up for yourself and your community. Laura is one of two winners of the Inspiration Awards, announced on World Down Syndrome Day (March 21, 2017). The Inspiration Award aims to celebrate the community’s “unsung heroes” and to show the range that ‘See The Ability’ can encompass. As an Inspiration Award winner, Laura will receive a $500 bursary. “She will be triumphant in all that she sets her mind to because she believes in the power of her own ability,” wrote Ingrid Muschta, Communications Director at DSAH. Laura was nominated by Jennifer and Ingrid. The Inspiration awards will be chosen by a committee of CDSS leaders – members of VATTA (the VATTA Chair and Vice Chair), members of the CDSS Board of Directors Advocacy Committee, and members of the CDSS Staff. These awards are for people with Down syndrome. Nominees must live in Canada. Nominees are not required to be members of the Canadian Down Syndrome Society. 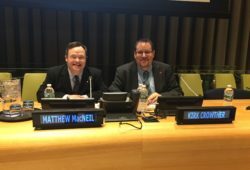 Nominees must not be a full or part-time paid staff member, board member, or committee member (for example, VATTA, or the Conference Committee) of the Canadian Down Syndrome Society. Past winners of the Canadian Down Syndrome Heroes are ineligible to receive this award. Past winners of the Canadian Down Syndrome Society’s Self-Advocate of the Year Award are ineligible to receive this award. Past winners of the CDSS Awards are ineligible to receive this award again. Previous winners of the Canadian Down Syndrome Heroes – Honourable Mentions and Canadian Down Syndrome Heroes – The Super Six are still eligible to enter. One (1) letter by the primary nominator on why the nominee deserves recognition (600 words MAXIMUM per letter). One (1) to two (2) reference letters by someone other than the nominator (600 words MAXIMUM per letter). Specify that the nomination is for the Inspiration Awards in your letter. CDSS has the option to grant a worthy recipient either award. To ensure a successful nomination, please refer to the award requirements. Please submit your nomination letters – one letter by the primary nominator, one to two letters by people other than the primary nominator – by the extended deadline February 28, 2018. We accept nominations via Email or Mail.